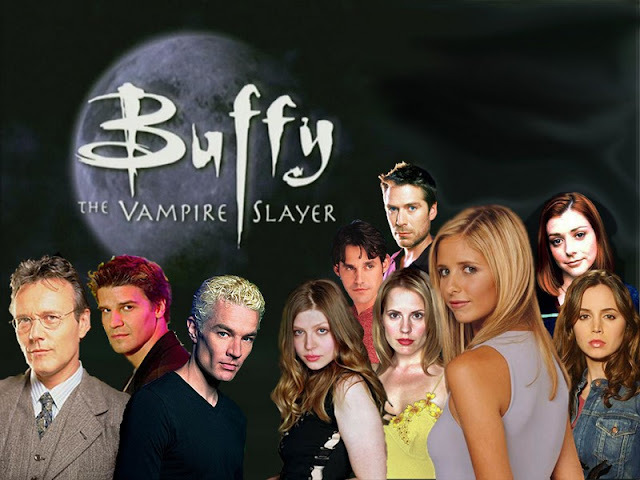 Stories about Buffy Summers, as well as her family, her friends and the adventures they have..
Set after Earshot. Willow’s trying her best to come up with a good poem, and does find a good thing to write about — Oreo cookies. But she gets writer’s block. Luckily, Oz helps her out. When Buffy returned to Sunnydale after spending three months in Los Angeles, she was not in the mood for a party; she needed to clear the air between herself and her mother. AU. Oz makes it clear, in his own way, that he won’t share Dawn with anybody. Nominated at the Sunnydale Memorial Fanfiction Awards, Best Alternate Universe, Best Pairing Unconventional. Post-Buffy vs Dracula. What would’ve happened if Dracula had visited the youngest Summers sister? This is my take on it. AU. Cordelia is still with Xander. She asks him how anybody can cope with having parents like his. His answer surprises her. Title taken from a line in the poem “Ode to a Grecian Urn” by John Keats. Cassie Newton watches over Buffy and Dawn. Spoilers for s07e04 Help. Set after Once More With Feeling. Sweet hears a very familiar song..
A Paris art buying expedition undertaken by Joyce after Buffy moves to her first dorm leads to a meeting with a pair of vampires and a dangerous invitation. Mayor Richard Wilkins receives a letter from the last person he’d get a letter from — namely his late wife, Edna May. Originally written for the Dead Letters Home challenge. Gib Cain — from the Season 2 episode Phases — writes his last letter to Buffy and Willow.. AU. This is what could’ve happened if Dawn really was Buffy’s sister..
Oneshot. Post-Witch. Amy remembers something she did when she was twelve while sitting beneath a willow tree in her backyard. Set during the apartment scene in Anne from Season 3. Buffy reflects on her job as Anne the Waitress and the truckers that sexually harass her on a daily basis. Based on the diner scene in the episode Anne from Season 3. Rated for mentions of sexual harassment. What would the Buffyverse have been like if Dawn Summers had actually been born as a human? Anya writes a last letter to the Scooby Gang..
Marcie Ross reads over her yearbook and soon comes to a conclusion. Set after Him in Season 7. Dawn assuages Buffy’s fear that Dawn might be angry with her because of what happened with RJ, and the two have some sisterly bonding time. Xander writes a last letter to Anya..
Set after Gingerbread in Season 3. Buffy tells Roy Dukeshire to watch himself, or else learn why she’s the Slayer the hard way.. Missing scene from the Season 5 episode Buffy vs. Dracula. Dracula’s thoughts on Buffy’s mother, and how her life would be if he sired her as a vampire.. AU. Buffy writes a letter to Oz, telling him how much he means to her, and also wishes him well, too. Xander writes a last letter to someone. The person he writes to is someone he admits he’s been envious of — but it’s not who we initially think it is. Deputy Mayor Allan Finch writes a last letter to Faith Lehane, telling her a secret he had kept to himself, while also wishing her the best of luck. Amy writes her last letter to Willow..
Mayor Richard Wilkins writes a letter to his late wife, Edna.. Episode: s04e16 Who Are You? Faith writes a letter of apology to Buffy..
Buffy writes a last letter to her friends, and makes a confession while she’s at it..
Cordelia writes a last letter to Angel..
Mayor Richard Wilkins III writes a letter to Buffy..
Cordelia writes a letter to her fans that also includes Angel. After his death, the Master (aka Heinrich Joseph Nest) writes a letter to Buffy, remarking on her strength, and telling her she was the only one worthy enough to have actually killed him that fateful night. AU oneshot. Buffy works as a stripper at the Cat Club. She knows that, although her job pays really well, she has to sell her body, as well as her looks and her dignity just to earn money in order to pay the rent. Prompts: Buffy, exotic dancer, gentlemen’s club, money, work.. AU; set after Chosen. Inspired by Got to Be by Latch Key Kid. Dawn remembers what Buffy had told her before jumping off the tower in The Gift and what happened after Spike saved Buffy from combusting in Once More with Feeling before writing in her journal. Tara writes a last letter to Willow..
An original character writes her thoughts on Dracula, Buffy Summers and how being temporarily transformed into a vampire in the Season 1 episode Nightmares didn’t change Buffy one bit personality-wise..
Jonathan writes a last letter to the last person someone would expect him to write to..
An original character muses on Harmony Kendall..
An original character’s thoughts on the Season 3 episode Gingerbread..
An original character’s thoughts on the Season 1 episode The Harvest.. AU. Faith writes a last letter to Angel, explaining about her past and why she is the way she is.